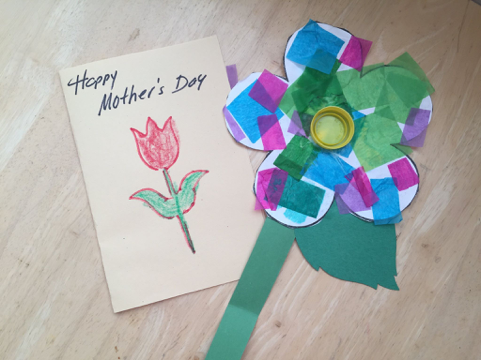 There was a lovely Mother’s Day card and paper flower in my son’s backpack yesterday. “Lovely”… that is… except for the fact that it had nothing to do with my little boy. The card was drawn and shaded with the bold, confident strokes of an adult. A bottle cap was perfectly centered in the construction paper flower. Tissue paper was placed on the petals with precision. The message inside was equally bold and precise. Dylan has Down Syndrome and autism. Although he is 8½ years old, he is small and developmentally very much a toddler. He has sensory issues and doesn’t like the feel of glue or paint on his fingers. He is impatient and would much rather throw a crayon than draw with it. I have a binder of treasured keepsakes labeled “Dylan’s Artwork.” Flipping through, everything is messy. A few lines of scribble here… A single off-center wad of tissue there… And I love it. I love my son’s messy, minimalist art. It is good enough for me, because HE is good enough for me. I know how hard it was for my little boy to sit still and focus. I know he struggled and squirmed when his teacher made him do something out of his comfort zone. Looking at his scribbles, I see the patience and dedication of the teachers who helped him do it. It fills my heart with gratitude. The thought behind this Mother’s Day craft was nice, but it has no place in my keepsakes. The message is either that Dylan’s own efforts wouldn’t have been good enough… or that it would have been too much trouble to work with him. Either way, it makes me sad. I wish more teachers understood that Moms know exactly who their children are. I love Dylan the way he is. Please send home scribbles that show you know him and appreciate him, too. That’s the best Mother’s Day gift I could ask for.